Thank you to Dr. Brett Rushing and MSU Extension Service Coastal Plains Branch for hosting our 3rd Annual Wildflower Trails of Mississippi Field Day. The day began by taking a tour of Dr. Rushing’s test plots where he showed us his research of the difference in planting times and herbicide applications as well as plots that were planted with seed collected wildflowers along Mississippi highways. We had several speakers including Shaun Broderick, Truck Crops Experiment Station; Pat Drackett, Crosby Arboretum; and Beth Foose, Little Bluestem Farm. Thank you to our Keep Mississippi Beautiful Affiliate Directors who were able to join us: Martha Stubbs, Keep Mendenhall Beautiful; Evelyn Copeland, Keep Simpson Co. Beautiful; and Robin Rosenthal, Keep Indianola Beautiful. The field day was a great success and we hope to see you all again at next year’s field day event! Interested in participating in the Wildflower Trails of Mississippi? Join Wildflower Trails of Mississippi for the third-ever wildflower field day, planned for Thursday, June 21 from 9:30 a.m. to 2:30 p.m. The Mississippi State Extension Service will host the field day at the Coastal Plain Branch Experiment Station located at 51 Coastal Plains Road in Newton. Lunch will be provided. Limited seats are available.Please RSVP by June 8 at wildflowertrailsofms.eventbrite.com,email neeley@keepmsbeautiful.com or call 601.853.4441. Wildflowers have lots of fans! The Wildflower Trails of Mississippi works with its many partners to teach Mississippians about wildflowers. Recently, we hosted a Wildflower Field Day at Mississippi State Extension Service’s Coastal Plain Branch Experiment Station in Newton. We learned about nativ e seed production, backyard habitats and milkweed management as well as took a field tour. 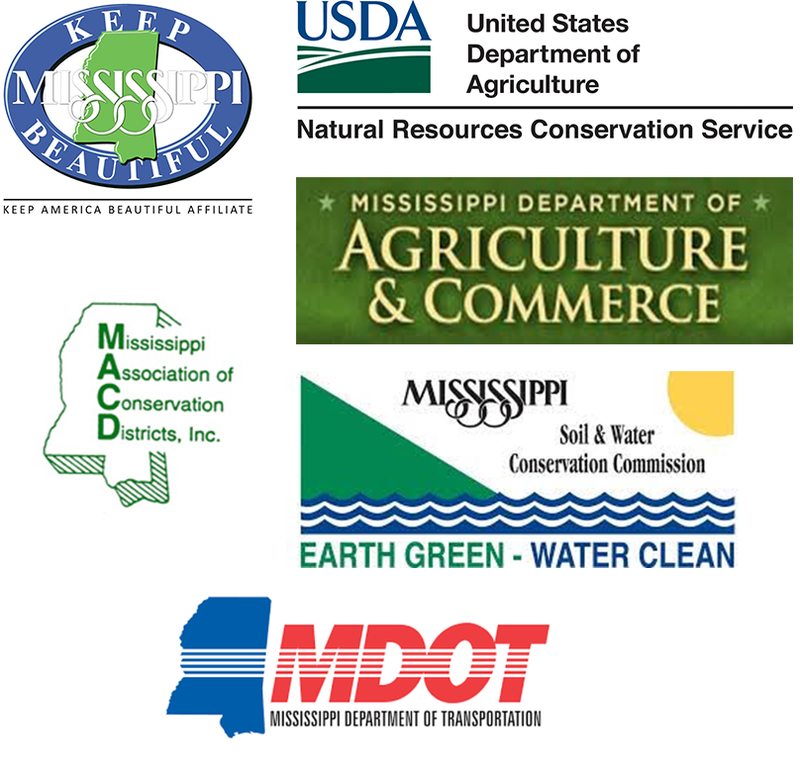 A big thank you to all of our partners, including Keep Mississippi Beautiful, Mississippi Department of Transportation, Mississippi Association of Conservation Districts, Mississippi Master Gardeners, Mississippi Soil and Water Conservation Commission and the U.S. Department of Agriculture’s Natural Resources Conservation Service. Winona Mayor Jerry Flowers (left), State Sen. Lydia Chassaniol (right), and others meet to select sites for wildflower plantings. In a year or two, new wildflower plantings along U.S. 82 between Carrollton to Kilmichael will give citizens a more beautiful drive. Through the Wildflower Trails of Mississippi, Keep Mississippi Beautiful (KMB) is working with local leaders to plant wildflowers along this 22-mile corridor in Mississippi. KMB launched Wildflower Trails of Mississippi in 2015, and since then, wildflower plantings are thriving across the state – from the Coast to Crystal Springs. A wildflower planting along U.S. 51 in Crystal Springs. The goal is to have these new plantings bloom like these. KMB is working with city officials in Carrollton, Winona and Kilmichael to plant wildflowers in the median along the U.S. 82, a major corridor across Mississippi. The plantings will include Black-eyed Susans, Plains Coreopsis, Purple Coneflower and a variety of native grasses. KMB worked closely with Mississippi State University Extension Service to select ideal plants for Mississippi roadways. KMB plans to plant in the spring, meaning blooms as soon as next summer. As the plantings flourish, KMB expects more blooms over time. Learn more about Wildflower Trails of Mississippi. Also, please let us know what type of wildflowers you are seeing in your area by becoming one of our Wildflower Watchers. People frequently ask us if we sell or distribute packets of wildflower seeds. Unfortunately, we don’t at this time. We have a limited quantity of seeds that we’re using for community-size projects. But don’t despair! You can still find wildflower seeds for your yard. We’ve poked around the Internet as well as asked some of our friends for some in-state and out-of-state vendors. Additionally, be sure to contact your local office of the Mississippi State University Extension Service for their tips and recommendations. This list is a work in progress. Please let us know of any recommended vendors that you’ve found! We are so excited! One of our inaugural projects, a wildflower planting in Crystal Springs, now boasts its first blooms. The planting is located on U.S. 51 headed into town. It’s just been a few months from planting, and the highway is looking beautiful! Thanks Mayor Sally Garland for the photo of the flowers. Neeley tells other Keep America Beautiful affiliates about the Wildflower Trails of Mississippi project. 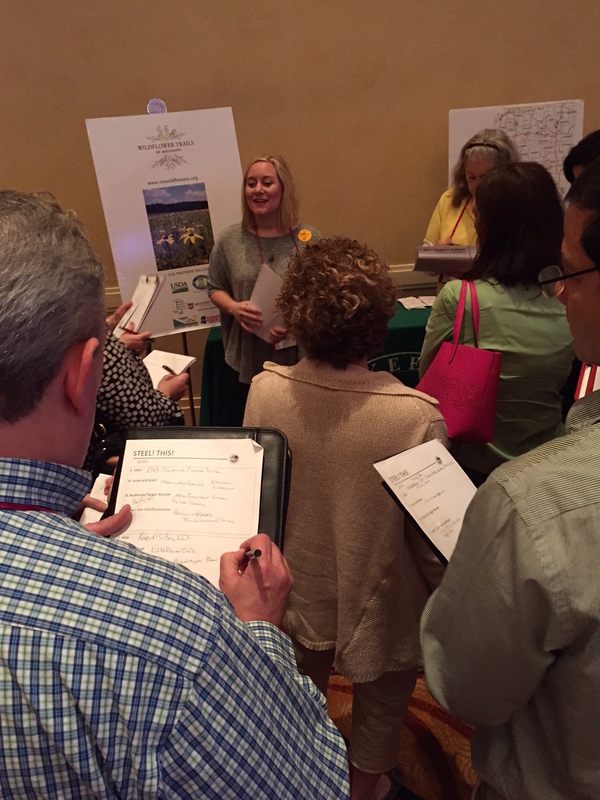 Earlier this week, we took Wildflower Trails of Mississippi on the road… all the way to Orlando, Florida for the Keep America Beautiful annual conference. Keep Mississippi Beautiful is part of the Keep America Beautiful network, and we were asked to share our project with other affiliates during the “Steel This” session. Sarah and Neeley did a great job in sharing our wildflower story. People were excited about our project — and talking about ways they planned to take the idea back home. Keep America Beautiful has three pillars, one of which is beautification. Wildflowers are a wonderful way to beautify our roadsides and communities.